My pictures are pretty terrible, sorry about that. I made it in the day but for whatever reason didn't think about making it all pretty in a bowl for you. I think I was distracted (go figure) by the excitement of making homemade ravioli at the same time. Foreshadowing for next week anyone? For my birthday I received a copy of The Homemade Pantry: 101 Foods You Can Stop Buying and Start Making. (That is a link to the author's site and she gives you a list of place to buy it if you are interested). I am so excited about this book because it has so much cool information and fun recipes that are easy to make at home. I was all about the cheese section, mozzarella might be next. Apparently my sister made goat cheese at home this week too! We are a crafty bunch :). 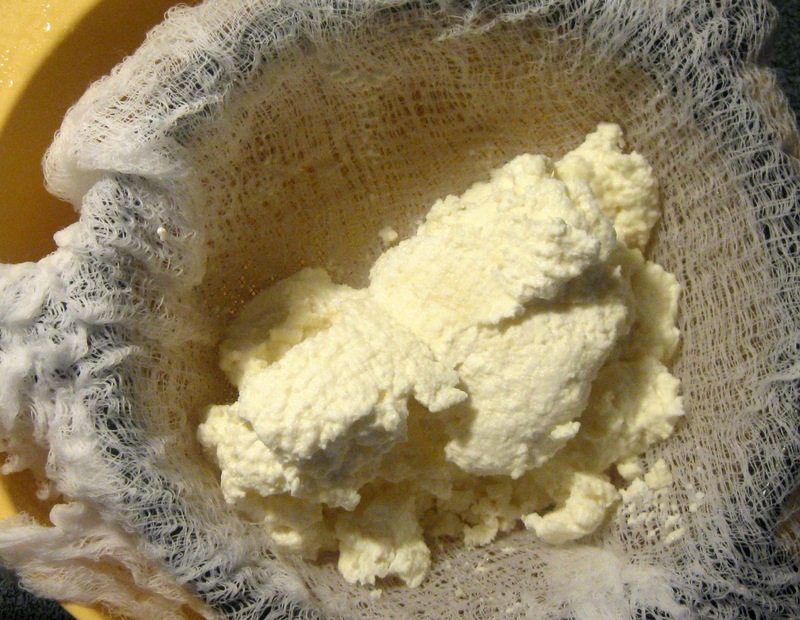 When you make cheese at home you will have whey left over. You can throw it away if you want to or you could make bread with it or add it to soup or stock. Those recipes are also in the cookbook :). So of course why would you throw it away! Unless you don't have the room or the time. Yeah, I could see that. Anyway...on to the recipe! 1. In a large, heavy pot on the stove put a piece of ice and let it melt while swirling it around the bottom of the pan. Add the milk and lemon juice then stir for 5 seconds but do not touch the bottom of the pan. 2. With the pot over low heat attach a candy thermometer to the inside. Heat the milk to 175F over 40-50 minutes. You can stir once or twice during this time but do not touch the bottom of the pan. 3. Raise the heat to medium-high, then without stirring, watch the temperature until it reaches 205F, 3 to 5 minutes. The milk should not boil. Remove the pot from heat and let it sit for 10 minutes. You are left with curds and whey. 4. Over a large bowl place a fine mesh sieve then line it with a double layer of damp cheesecloth. 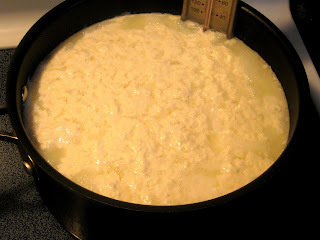 Use a large slotted spoon and gently scoop the curds into the cheesecloth. Let the cheese drain for about 10 minutes, then sprinkle with sea salt if desired. This will keep in the refrigerator for 3 to 5 days.